Published author David Boyer is a FoxyPremium fan and trumpet player for the acclaimed Chatham (MA) Band. After eye surgery, he came up with an ingenious way to read sheet music while playing, using FoxyUtils’s JPG to PDF tool. We asked him to share his story with us, here’s what Dave told us. Clearly, I needed a new approach to trumpet playing after cataracts, finding a macular hole in my eye and undergoing the celebrated penalty after surgery to fix it (lying face down for a week). Fortunately, Hewlett Packard and FoxyUtils came to my rescue when I found that, even fixed as well as possible, my vision at around 33 inches from my nose was still shaky – right where the music is when playing trumpet. 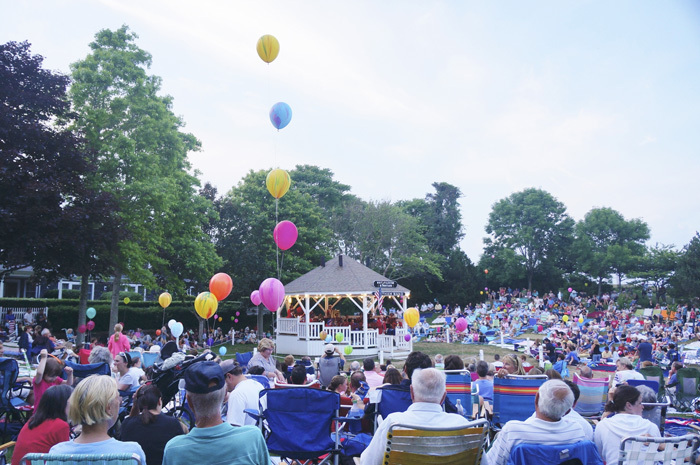 It was important to fix it, since I (an amateur piano and violin player) had started playing trumpet at age 60 just to join the most popular town band in America – the Chatham (MA) Band on Cape Cod with its many connections to famous musicians and characters in history and a turnout of 3,000+ people for each summer concert. I had read that the Brussels Philharmonic in Belgium had converted all their music to digital format and played from tablet screens. This gave me the idea to buy a HP 360 degree laptop, one with a screen that folds the whole way until its back is against the back of the keyboard, so it can sit on a music stand. Sheet music scanned digitally can be read on screen, but, most importantly for me, can be swiped with two fingers moving apart to enlarge the music. FoxyUtils made the whole process simple. Here’s my simple yet effective two-step workflow to create files that enable me to keep reading music while playing. 1. 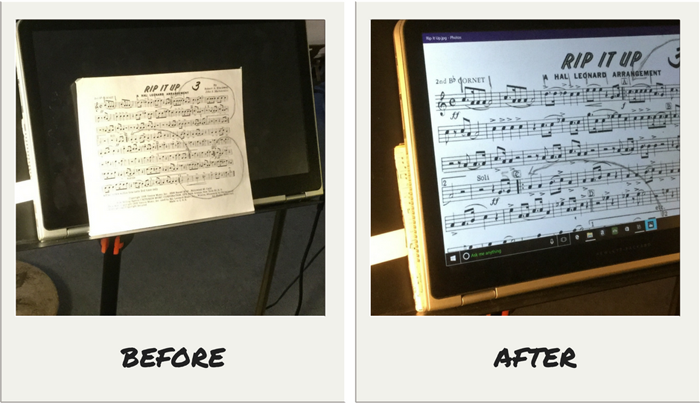 Scan the sheet music – I used my Epson V300 scanner, which gives me a picture in JPG format. You can probably use a variety of tools to digitize the music, this is what I found easy and available, since I already had the scanner. 2. Go to FoxyUtils and select a JPG to PDF format conversion. I upload all the sheets for a given song (up to four sheets in my case) and hit the start button. In seconds I have a PDF of the song with all sheets connected, such that I can simply swipe the screen to move the music forward (upward) as I play. I had read that the Belgian musicians use a foot pedal to move the music forward as they play, leaving their hands free for playing. However, I found that I have rests (short breaks of a few seconds) often enough that I can simply make a quick reach and swipe, or occasionally play with one hand while I swipe. Most musicians agree that the hardest part of the job can often be music handling, my workflow can help you move to a digital workflow, even if you have perfect eyesight! Every week in the summer I put away in alphabetical order the twenty pieces we played the previous Friday and dig out the next twenty. The director/librarian has the daunting job of keeping about forty musicians supplied with the nearly two hundred songs each season. Paper music requires clips to hold it on breezy evenings. Occasionally, a music stand will get pushed and dump paper music on the floor of the bandstand. A scanner and FoxyUtils can eliminate all this hassle, as I suspect they will for most bands/orchestras over the next year. And I found the cost for FoxyUtils very reasonable compared to similar services, whereas the ease of use is better. David L Boyer lives on Cape Cod with his wife and visits grown children and grandchildren in London and Maryland. He builds boats, sails and has played piano and violin but began trumpet lessons after retirement and now plays in the Chatham Band. He is the author of We Can Hear You on the Hill: The History of the Chatham Band, available at CreateSpace or on Amazon.